Done a brevet or twenty but not as quickly as you’d like? The issues are the same whether you’re struggling to make the cut on a 200km, trying to improve your safety margin or build up a sleep buffer on a longer randonée, or even if you’re finishing comfortably within time but want to go round quicker. Hey – maybe you’re just sensible and want to ride at the same speed as the group, but for less effort! It’s tempting to zero in on a lighter ride (moving to a carbon frame, lighter wheels, and so on) but is that really because it’s an effective way to increase ultra distance speeds, or is it just because it’s so easy to quantify? So before you splash the cash on an amazing pair of wheels… stop! On the flat, the main force acting against the rider is wind resistance, followed by rolling resistance in the tyre and other losses (such as drivetrain friction). According to Steve Gribble’s neat simulator, resistance due to airflow at a modest 17mph is already 3/4 of total resistance. Let’s take that as typical for an upright rider for the purposes of the experiment – it means that a change in weight of any amount can influence at most 1/4 of the forces acting on the rider at this speed on the flat. That is – even if you rode with 100kg of gold in your saddlebag, it could only magnify that small 25% component, the 75% would be the same as if the saddlebag was empty. I don’t know about gold, but I can confirm that you can go just about as fast on the flat even towing a 70kg washing machine. Conversely, when climbing steeply the main component acting against the rider is the force due to gravity. If climbing slowly enough, the effect of wind resistance will be negligable, leaving only rolling resistance. We can think of both of these factors as being directly proportional to weight (twice the weight means twice the force due to gravity and twice the rolling resistance). 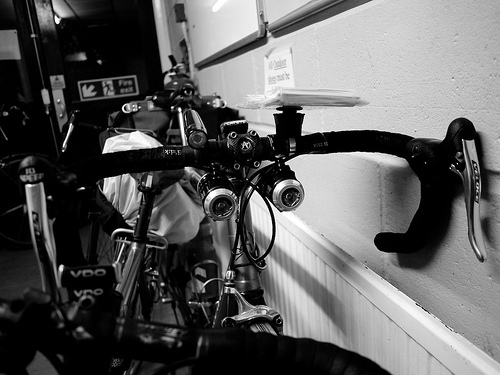 Always express changes in weight as a proportion of the change in total kerb weight, including the rider. Forces resisting the cyclist which are sensitive to weight *cannot distinguish* the weight of the bike from the weight of the luggage and rider. (Yes, the wheels are a minor exception to the rule, but that’s a small effect limited to changes in speed, and so we can forget it for this discussion). For our climbing scenario, the penalty of the extra 1.18% is an increase in all the forces acting against the rider, so a climb taking 10 minutes will now take 101.18% as long- that’s roughly 10:07, a penalty of seven seconds (600s * 101.18 = 607s). We’ve established that the effect on the flat is limited to at most 1/4 of this amount, or (1.18 / 4 =) 0.295% . A section of flat road which takes 60 minutes to traverse will now take 60:10, a penalty of ten seconds. Bearing in mind that this is an *upper bound* (and pretty conservative at that), you can start to work on the maximum possible penalty of that extra kilo in your own situation. Say a 200km brevet takes 8 hours of actual moving time. If the ride is flat, the maximum penalty of the extra kilo is 85 seconds. If the ride is so completely uphill such that you never feel the wind on your face (and never descend!) the maximum penalty of the extra kilo is 339 seconds – under six minutes. At most you can spend half a ride going up, so we can put a practical upper bound of under 3 minutes per kilo of extra weight (for an 8 hour ride, for an 85kg rider+bike combination). It doesn’t matter how flat or hilly the ride is or how strong/weak the rider is (these things affect the actual impact of weight but we’ve identified the upper bound). 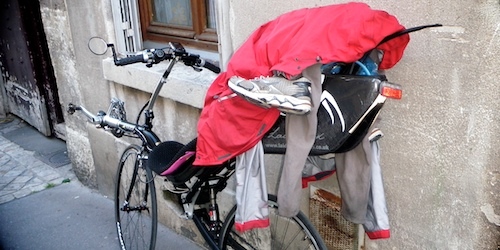 Riding to PBP – don’t worry, I left the tent, sleeping bag and spare clothes in St Quentin! What about a long ride such as PBP? On PBP I rode for 51 hours at an average 15.2mph and PBP is largely flat – let’s say 1/4 climbing steeply, 3/4 limited by air resistance to be grossly conservative. My bodyweight was up (and the bike was fully laden) for a kerb weight of 105kg. What price an extra kilo on PBP? 1 into 105 is 0.95%. My nominal climb time being 12h45m, I’d bear a loss of just over 12 minutes. For my ‘flat’ time of 38h15m, I’d bear a loss of 21 minutes. Total penalty 33 minutes. If you think weight’s not important at all, that’s probably more than you’d expect (if you lose a stone of bodyweight in preparation, you’ll pick up 2.5 hours over four days for sleep). On the other hand, it does highlight the rather pitiful savings of something like a 500g lighter wheelset (you’ll pick up 15 minutes over four days). Remember these are upper bounds too – the real benefit is likely to be significantly smaller. 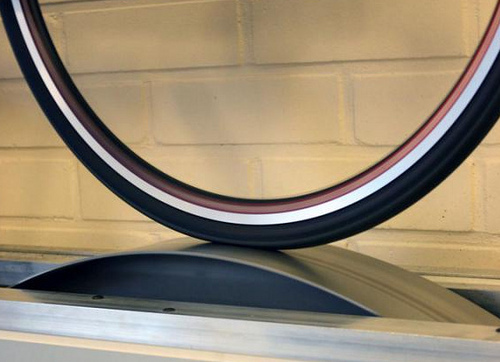 Rolling resistance is a sharp contrast with weight. Weight is easy for everyone to measure and it’s easy to overestimate the effect, whereas rolling resistance is hard to measure and it’s easy to underestimate the effect. Tyres which roll fast don’t even necessarily feel fast, although if you compare a top quality carcass with a really cheap one, the difference is palpable. You need to take a look at lab test results to really appreciate the difference in power consumption. Obviously there may be good reasons to ride any particular tyre (puncture resistance, durability, comfort, price) but be aware that your choice of tyre and tube make a massive difference to your efficiency, especially at randonneuring pace. The calculator is using an approximation of an averagish road tyre by default (CR of 0.005 – something like a 23mm Gatorskin with butyl tube, according to Google). You could easily be on a race tyre that’s much slicker; punching in a 23mm Open Corsa EVO CX on latex inner (CR of ~0.0025) drops the rolling resistance component of travel at 17mph from 27% to 18% (or alternatively, the power estimate required to maintain that speed slides from 124W to 116W, a saving of 6.5% of total drag). Let’s express this in brevet terms: on an 8 hour (rolling time) 200km, your speed will average 15.6mph. If that’s on the aforementioned Gatorskin, switching to the Open Corsa CX will give 0.8mph boost (or, you can save a whopping 375kcal by soft pedalling). My actual average speed on PBP was a comparable 15.2mph, so an increase to 16mph over ~50 hours would be a saving of around 40 miles, or 2 1/2 hours. That’s like losing 5kg of weight! (Sadly, I actually rode PBP on pretty fast GP4000 tyres, so that option isn’t available to me). Furthermore, be aware that wider tyres run at lower pressure at more efficient, however much the smoother ride may feel slower or less lively. There’s hard evidence now that 25mm tyres are faster than 23’s (Finnish lab Wheel Energy say on average, about a 5% saving going up 2mm) and at the speed of randonneuring events, there’s no chance of increased wind resistance from a wider tyre holding you back by anything like that much. (There are plenty of other sources for this: Lenard Zinn   and of course Jan Heine  in particular is all over wider tyres). We’ve already established that at 17mph rolling resistance makes up roughly 1/4 of your losses (for the default values of the calculator in question). 5% of 1/4 is just 1.25% which might not seem like a lot, but what if we express it as compensating for 1kg of weight on a climb or 4kg of weight on the flat – how’s about that? While there’s no particular indicator that 28mm tyres won’t be even more efficient than 25mm (and for instance, cf Zinn, Schwalbe have published data that indicates the 32mm Durano is 10% more efficient than the 23mm – yes, those figures are the right way around!) there must be a natural limit. As tyres get wider they’re less likely to be made out of supple casings, if nothing else! The RR penalty of a small wheel is generally held to be offset by superior aerodynamics – hence data showing a lowracer travelling several mph faster than an M5 Carbon High Racer at equal power) but this is less likely to hold up at the low speeds of ultra distance riding. There’s not as large a body of data on small tyres, and I’ve seen values from 0.0045-0.0075 quoted for 406 slicks (so at best, a Conti or Durano will be on parity with puncture-proof Gatorskins!) however it’s not clear that these tests are always performed on a rough real-world surface. When imperfections are significant, such as on real brevet routes, smaller wheels are at an even greater disadvantage. This (along with practical issues such as commonality of spares) is why I think riders tend to gravitate towards designs with large front wheels on the recumbent/brevet scene. We could potentially be talking about 5% of drag lost to RR (offset by an undetermined proportional reduction in aero losses). First, it’s important to remember that you’re only going to be truly fast on a bike you’re comfortably able to ride the distance! That said, we can’t ignore that air resistance is the primary inhibitor of speed on a bike, even at brevet speeds. Simple optimisations of your riding position and style (for instance, flapping clothes) could easily outweigh anything you can do in terms of weight or even rolling resistance. I won’t draw this article out by going into aerodynamics here too, but as a point of interest, riding the Raptobike Midracer at the 150W gave me 19.5mph vs 16.5mph on my drop bar racer (or, would save 7 hours on PBP at the same average wattage). The dual big-wheel lowracer pictured above was even faster. You’re not going to get 3mph from smarter clothes choices or swapping your stem, but it’s not hard to appreciate that you could make changes well in excess of the 15 minute ‘cost’ of 1kg weight without anything so radical as going laid-back. Which box/fairing is that you have? Thanks again for another interesting article by the way. Is there a good resource anywhere that has lists of tire rolling resistances? I’ve had a trawl of the web, but not come up with much. Also, why does the inner tube make any difference? This was very interesting stuff! In particular suprised about the rolling resistance of tyres. I don’t feel so bad about my 35c schwalbe marathons now! Having riden heavily loaded bikes i can say that added mass accelerates you much faster going down hill => less effort and more speed. i wonder if the expended energy going up is recouped by the added inertia going down? i suspect it would be difficult to measure…..
It’s true that it would be hard to measure precisely, but we can ball-park the sums and see that time lost climbing is always much more damaging than gained on a descent. Conservation of energy tells us that (at best) the energy required to lift a heavier bike uphill might be exactly returned going down the other side, but only if you cycle in a vacuum with perfect tyres and bearings. 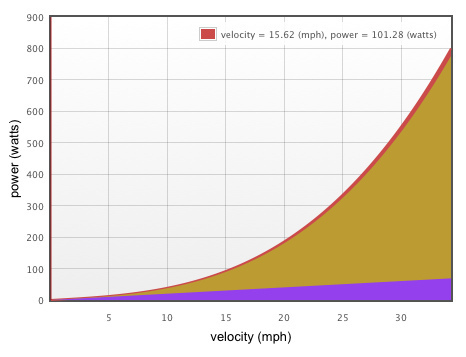 You can do a simple thought experiment to see for yourself – if you had a bike trailer and put a person on it, you would have (roughly) doubled your mass so your speed uphill for the same effort would be halved. However, if you imagine freewheeling downhill at 40mph, it’s obvious that the extra body and a trailer would not see you reaching 80mph! Scaled down, this is the reality for riding a heavier bike too. It’s not a reason to obsess over weight but it’s certainly not earned back. Not sure how I came across your web site… but its interesting! The reason for adding this comment is that surely if the road is flat ie no energy lost to gravity, then Newton would tell us that to maintain a constant velocity, we need only replace the energy lost to rolling resistance and air resistance? So weight doesn’t matter in that exact scenario. Also in context of tyre rolling resistance, the lumpier the road the bigger the tyre you need, as we can see from looking at off road vehicles, fat tyre bikes and even tanks. If the road were super super smooth like an indoor track then you could have pencil thin tyres at monstrous pressure (oh yes and they do!) because there is no vertical energy to absorb, which is what causes the energy loss. As you say, when you climb it’s necessary to “pay off” gravity for the height you climbed, and this isn’t the case on the flat. However, tyre rolling resistance, bearing resistance etc are proportional to weight times speed. If you double your weight (or your speed) you double your rolling resistance (there’s a constant in there somewhere too). The example in the article shows rolling resistance to be 25% of losses at 17mph. If you doubled your weight, you’d then have (original aero 0.75 + twice RR at 0.25 = 1.25) = 25% more resistance to overcome, so you’d be going 1/1.25 = 20% slower. 20mph down to 16mph for instance. OK, yes I see. Using the linked page’s calculator, I see that if I borrow a UCI barely-legal bike from my LBS which weighs 6.5kg and in my regular cycling kit I weigh 84kg then with the default values for all the constants, 200W of output on a flat road would give me 33.13 kph. Then I hop onto my wheels-of-steel at 13kg (I’m still me) and now 200W gets me 32.93 kph so a reduction in speed of .2 kph. Now I go on a long bike ride so I take 6.5 kg of supplies (living in Oz it’ll be mainly water! ), so the bike goes to 19.5 kg and my speed further reduces to 32.74 kph ie another .19 kph gone. Knowing that the correct tyre pressure is the pressure at which the tyres depress 15% then I knowing the bike+rider weight I would pump up the tyres a bit, if the pressure rating allowed, and that would reverse some of the increase in Crr from the tyre rolling flatter. Thus I would posit that in the real world, on the flat, weight has little overall effect, and the occasional breeze / gust / passing truck will have more effect. Anyway, handily we could add a citation to en.wikipedia.org/wiki/Bicycle_performance where it says “have almost no effect on cycling performance when riding on flat ground” in the context of bike weight and fancy components. It would though improve the overall quality of that article. PS I’ve been applying your gear inches thinking in a slightly different way, and will comment on that in due course. The calculator (hopefully) assumes that Crr remains the same when the rider’s weight increases. In reality it will vary, but I’m not sure that it would be significant. The slow-down comes from the fact that power loss =~ weight X Crr and cannot be counteracted by changing tyre pressure. (In fairness, not changing tyre pressure might make it even worse, but I suspect the calculator is idealistic). This page allows a measured comparison of power losses due to increasing weight on the flat, because each tyre has a 30mph data point for 185lbs and 200lbs. The increase of 15lbs (8%) costs, not surprisingly, around 8% extra effort. (For instance, Continental Top Touring : 91.4W to 98.8W, or 8% – it varies, but in the right ball park for the measurement error?) – it doesn’t impact wind resistance remember, which is the majority of what’s holding us back.